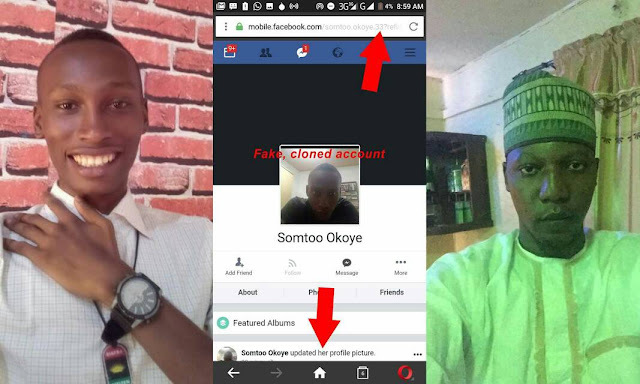 One Somtoo Okoye, a strong Biafran agitator, a tout and Bus conductor at Onitsha, Enugu Nigeria has called out on s fraudster who cloned his account and used it to scam his very close frienda whooping sum of N93,750. In my last post, I was writing about how Nigerians scam each other not knowing that someone, at the same time, was using a fake Facebook account bearing my name to scam Muhammad Junaid of his hard earned mone of about N93,750 in Bitcoin. It started when I wrote that I needed Bitcoin to buy. Muhammad and some others signified interest in my comment box. But because I was looking out for the cheapest rate, I took a pause to eat breakfast while waiting for more sellers to arrive in order to pick the best bargain. Now, somebody went and created a fake profile in my name, added Muhammad, asking him to send his Bitcoin to a wallet. Thinking that it's the same trusted "Somtoo Okoye" people have known for years and without asking any questions, he sent the Bitcoin to the scammer who disappeared, instantly deleting the profile/or Facebook deleted it. Now, I don't know why someone will use my name of all people to scam an unsuspecting fellow. In the close to 30 years I've been on earth, no human being dead or alive(in Nigeria, abroad, earth, afterlife) will say I've taken what belongs to him/her. No mortal can say I'm owing him let alone scammed the person. Why should someone bring disarray and confusion to my whole day now by using my name to collect money from someone? 1. The scammer who stole Muhammed Juniad's money or anybody's money using my name. That you may know no peace. Your entire lineage, generation and offsrings shall wipe away painfully before your very eyes. You shall die a very painful and shameless death. Your death shall be used by parents to teach their children why they should not do evil. If I have done the slightest yahoo or scam on anybody before, let all the curses come back to me but if I've not, madness scatter all the families and beneficiaries of you yahoo criminal reading this. You shall never see peace in your life from this moment.